Thanks for reading and checking out my page. 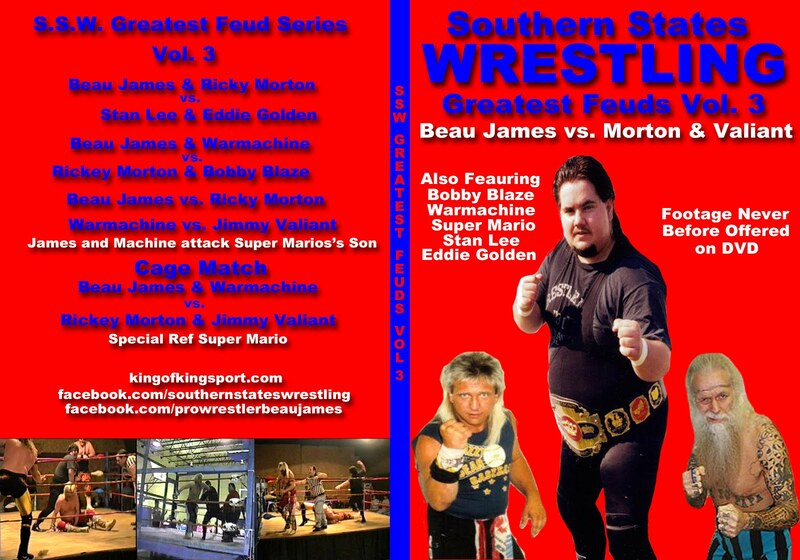 If you are a first time reader check out my book to the right and SSW DVDs to the left. The last several weeks Misty and I have been so busy I have not had the time to sit down and communicate with you guys as much as I wanted. First off a big THANK YOU to all of you who joined us in June for Summer Bash and this past Sunday for WrestleFest. Sunday was one of those special nights for me. Sitting in the dressing room with heroes like Ronnie Garvin and Jimmy Valiant listening to their stories and realizing I have many stories myself with these two. Jimmy is a big part of my first book. The reception and reaction the people gave me in the Mt. Carmel,TN Armed Forces Center WrestleFest night was second to none. And it means a lot to me. 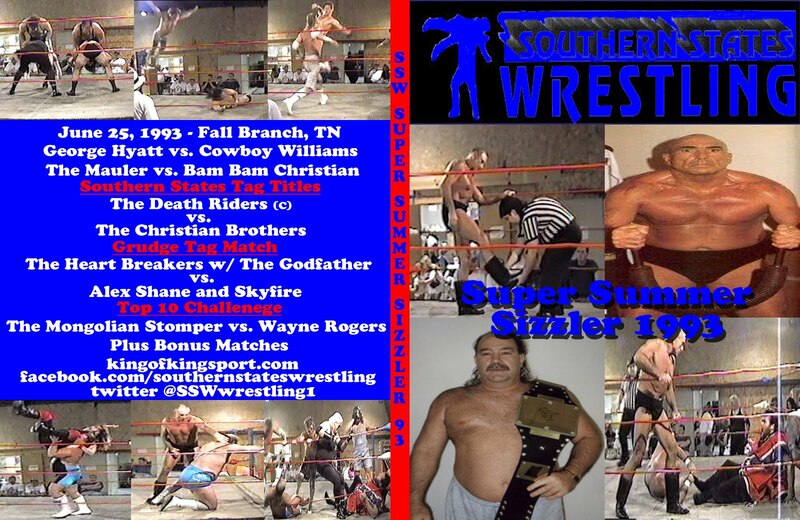 The Summer Bash DVD is to the left and WrestleFest DVD will be out Sunday. As I write this I have been home about an hour after attending a great concert with Jeremy Camp and Building 429 as a part of Kingsport's Annual Fun Fest. It was to be held in the J. Fred Johnson Stadium but due to lighting and possible tornadoes they made an announcement to evacuate the Stadium about 15 minutes before start time. Misty and I had our two nieces Katie and Belle with us. We had two choices long walk back to the car or next door into the famed Buck Van Huss Dome. The Buck Van Huss Dome was known simply as D-B (Dobbins - Bennett) High School Gym until it was renamed for Coach Van Huss in the 1990s. 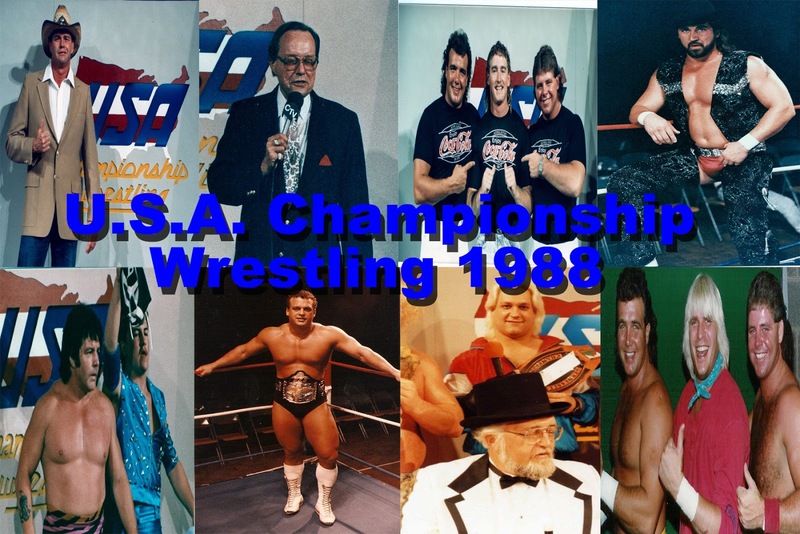 It was home to Jim Crockett's Mid Atlantic Wrestling for several years. I saw my first live matches there when I was eight years old. At that time it was the biggest building in the world to me. And even more important it had a ring in the middle of it with me heroes in it. I saw a sign tonight that said maximum seating 5,425. I know I have been in there with more people than that in there. But times have changed and fire codes and etc I guess 5,425 is it. Localized Interview for The Match that drew the record crowd to the Dome. Legends tell that as many were turned away as that were in the building. We were some of the first to enter the Dome Misty and The girls stopped ,but I took off for Section N row 2 seat 3. The place I sat for my first event. As I walked that round aisle to get to the section I was an eight year old again. I starred down to the tunnel the wrestlers came out. I could hear the cheers for Steamboat and Youngblood, the jeers for Slaughter and Kernodle, The crowd going crazy at the first sounds of Ooo Wah, Ooo Wah cool,cool kitty tell us about the Boy From New York City. 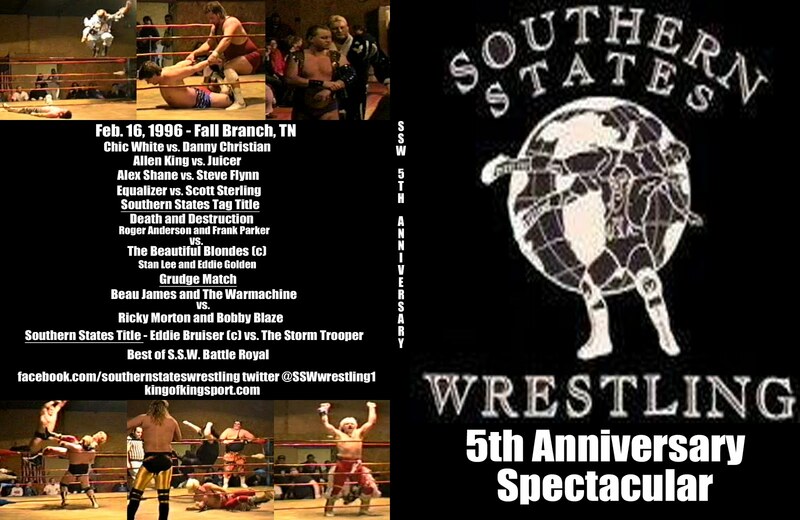 I spent many Sunday afternoons (most Kingsport events were Sunday afternoon but at Times they ran a Friday or Saturday Night at 8:15 now you know why SSW events starts at 8:15) in that Dome with my Dad and uncle Odell. My little sister Autumn started coming a few months after we did. At times my Uncle Earl and his son Sammy went with us. It was a family outing for us. As I sat there I told my wife and nieces all kinds of funny stories. I showed them where we were sitting the day so and so did this or that. All these years later I can remember almost everything I saw there. It did not take long for a deck of cards to come out and Misty and the girls to start playing "Go Fish". Hey we are a wrestling family. We can sleep any where and find something to pass the down time. As they played I sat there and thought about my Uncle Odell who we lost a couple years ago and my time with him there. I thought of my Grannie Hassie who I would go see or call after the matches and give a full report. I was flooded with memories. Regular wrestling cards left that building at the beginning of 1985. 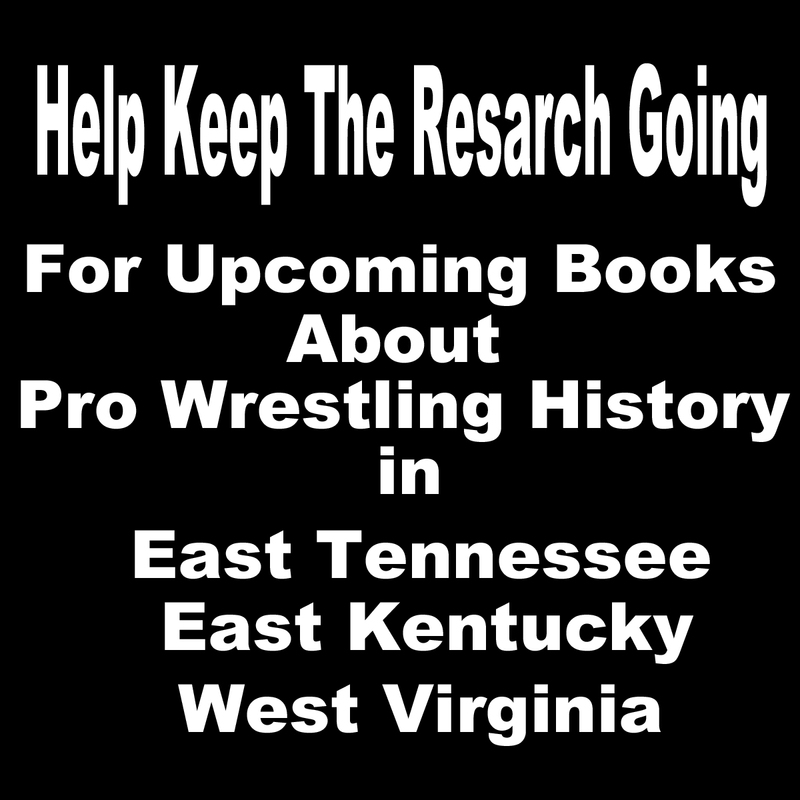 Mid Atlantic Wrestling moved to Johnson City's Freedom Hall some 30 minutes away in July of 1985. 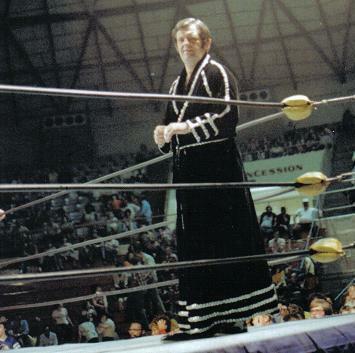 I was told by Sandy Scott that the move was made because Dusty Rhodes did not want Armories and High School Gyms on TV. 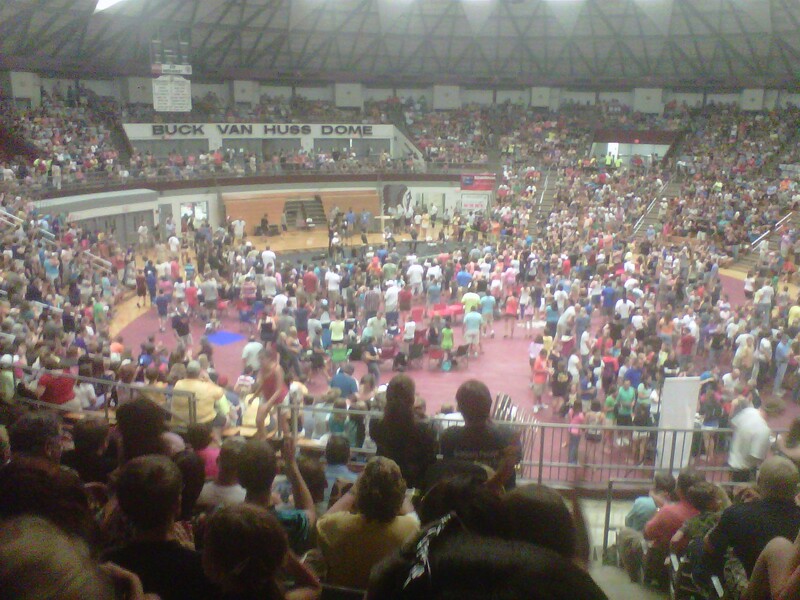 I guess Freedom Hall Civic Center sounded better than D-B High School Gym. Several thoughts came to my mind as I sat there tonight waiting out the storm. Like how much I miss my Grannie Hassie and Uncle Odell. I thought about all my heroes that I have been so blessed to work with over the past near quarter century. 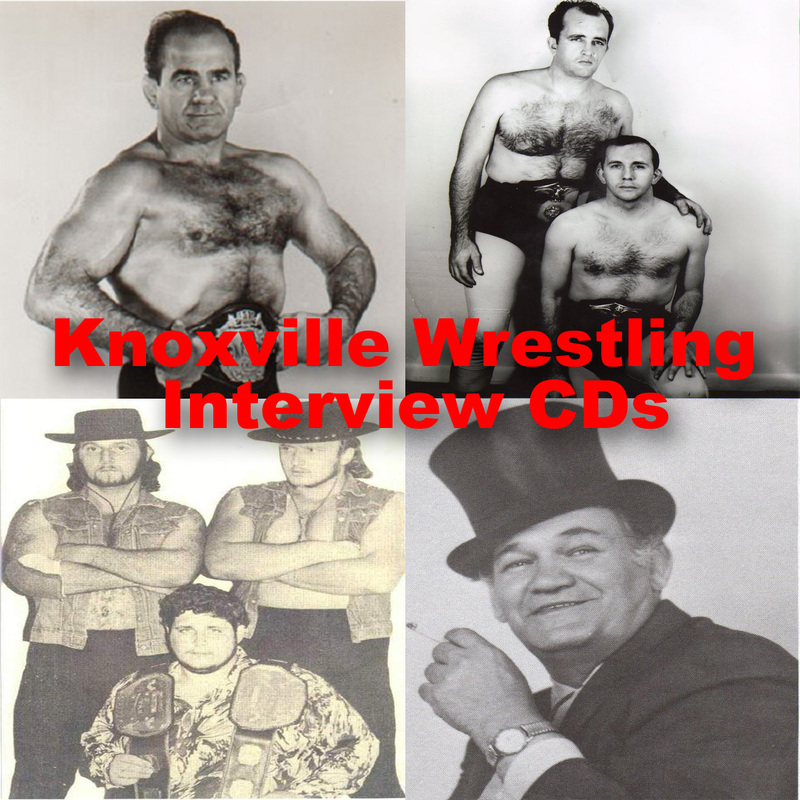 How years ago I was a huge Jimmy Valiant fan, you know the Boy From New York City (By the way of Tullahma,TN and Hammond,IN). Kabuki onces spit the Mystical Green Mist in Kingsport and it got on my arm. I ran to the bathroom as fast as I could to wash it off. When your 9 years old and seen wrestlers blinded by the Mist you have no idea what it will do to you. 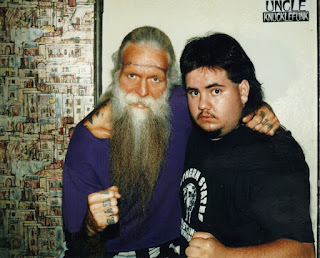 Me and Jimmy Valiant 1995 Cleveland Ohio. As I was sitting there thinking. I took the time to write a not to Jimmy on his face book about how much he means to me. He is a hero turned friend turned family. He spends Christmas with me and my family every year. I visit his home many times a year. I talk to him every few day. Misty says she loves it when "Boogie" is around because I'm always on my best behavior. He is always there for me. When my Grannie past he wrote me a long heart felt email. I have been to his family reunion a few times. And he has been here for not only me but my family over the years. If you would have told me at eight years old when I was watching him battle Joe LeDuc in my first live main event the relationship we would have now I think that I and my Dad who was sitting beside me would have told you that your were nuts. At about 8pm tonight they made and announcement that the Building 429/Jeremy Camp Concert would happen but it would be moved into the dome. They hurried and moved what they could inside. They used the Dome's P.A.. No stage. No Drums. As I sat there watching the people file in it was like a Sunday afternoon in 1983. We would get to the matches early because of all things I just wanted to look at the ring and hope to see a few wrestlers peak out and maybe sign my picture or program. Not all my memories tonight were about wrestlers. I sat there thinking of my Dad, Roy also. My Dad is a decorated American Hero of The Viet Nam War. He grew up rough and tough. He like my Mom worked hard for me and my sisters to have more than they ever dreamed of. It took me years to realize that. I mostly just thought he was hard on me because he thought I was a screw up. Over the years we have had many rough times. He never understood what drives me as a wrestler and promoter. He has had hard times trying to figure me out. There is probably no one on this earth that has made him madder over the years than me. And same can be said about him making me mad. For my 13th birthday he asked me what I wanted. I told him I wanted to go the The Great American Bash. He said OK when is it in Johnson City. I said July 15, but I want to go to Charlotte, NC on my birthday July 17 to see it in the Football Stadium. He took me. Not because he was a fan but because he could see how bad I wanted to go. And it was two days of just me and him. The story of this trip will be in my second book along with our second trip to Charlotte's Bash which is the day we almost died in the hood after a wrong turn. As I sat there tonight I had no memories of our heated arguments or throwing saws and 2x4s at each other. I just thought about my Dad and how he has always been there for me. Whether it was for $2 to buy a Steambot and Youngblood or Jimmy Valiant and Charlie Brown 8x10, $3 for a Mid-Atlantic Magazine, or my first wrestling ring to promote with. I still owe him for the 8x10s and programs but the ring is paid off. Camp and Crew drew the biggest crowd I have seen in the Dome for any event in years. But it did not surpass Flair vs. N. Koloff Jan. 1987 or Mulligan and Andre vs. Superstars in 1980. Between songs Mr. Camp spoke of how it seems that the world now is in an "in-titled state". Most think something is owed to them. They deserve what they want. And trust me dealing with these people in the wrestling profession now days. I hear that a lot. But I sat there thinking the only thing we are owed is death. Romans 3:23 tells us plain and simple all have sinned and come short of the glory of God. That's me, you, my heroes I spoke of, Mr. Camp, Members of Building 429. All of us. That's when I sat there thinking of my 3rd father. The most important my Heavenly Father. Who sent his only son Jesus to die for us all. That's me, you, my heroes I spoke of, Mr. Camp, Members of Building 429. All of us. John 3:16 tells us that our Heavenly Father The "I Am" The almighty, God loves us ALL that he sent his only son to be born of a human birth, live a sinless life, to die, and beat death, hell, and the grave. For ALL of us. I'm for one glad to know that some day I will see my Grannie Hassie, Uncle Odell, and other loved ones again. Not because I'm a wrestler, not because I'm on TV, not because of anything I did or can do. But because I gave my heart to Jesus. Romans 10:9 tells us as simple as it gets. If you confess with your mouth and believe in your heart that Jesus died for you and God raised him from the dead then you shall be saved. Lord I thank you for a wonderful and some times crazy life. I thank you for my family. I thank you for all my blessings and all the dreams of that eight year old little boy sitting in section N row two seat 3 that came true. I thank you for all my many heroes turned friends, I thank you for all my heroes I was able to share a car, ring,or hotel room with. I thank you for all my wonderful memories of my loved ones that have passed and I know I will see again. I thank you for this opportunity to share my memories on this site with many. Thanks for reading. We all still have a little bit of that eight year old in us.